Judge heard three days of testimony regarding aggravating and mitigating evidence surrounding the crime. 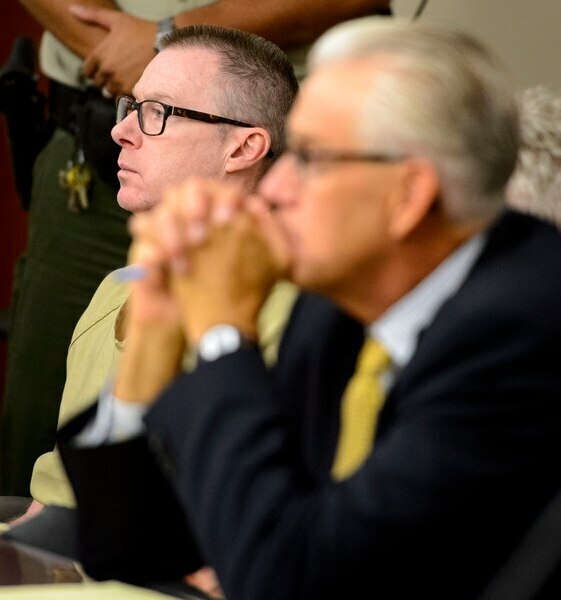 (Steve Griffin | The Salt Lake Tribune) Craig Crawford, center, enters Third District Judge James Blanch's courtroom for his sentencing after admitting that he trapped his 72-year-old estranged husband, well-known restaurateur John Williams, inside his home and then set it ablaze last year. Judge Blanch sentenced Crawford to life in prison without the possibility of parole at the Matheson Courthouse in Salt Lake City Thursday August 31, 2017. 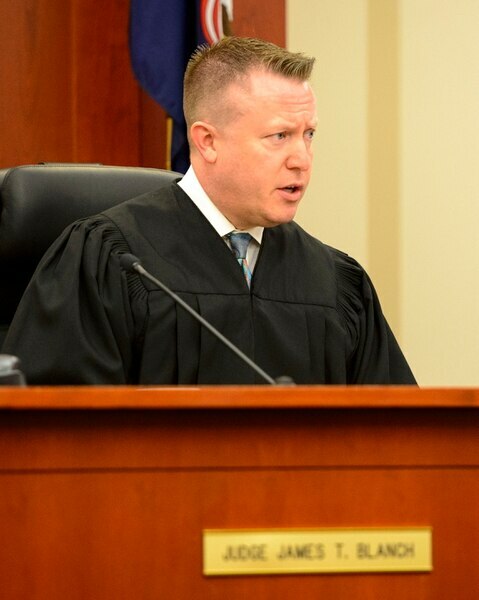 (Steve Griffin | The Salt Lake Tribune) Third District Judge James Blanch sentences Craig Crawford to life in prison without the possibility of parole after Crawford admitted that he trapped his 72-year-old estranged husband, well-known restaurateur John Williams, inside his home and then set it ablaze last year. Sentencing was at the Matheson Courthouse in Salt Lake City Thursday August 31, 2017. (Steve Griffin | The Salt Lake Tribune) Craig Crawford, listens as Third District Judge James Blanch sentences him to life in prison without the possibility of parole after Crawford admitted that he trapped his 72-year-old estranged husband, well-known restaurateur John Williams, inside his home and then set it ablaze last year. Sentencing was at the Matheson Courthouse in Salt Lake City Thursday August 31, 2017. 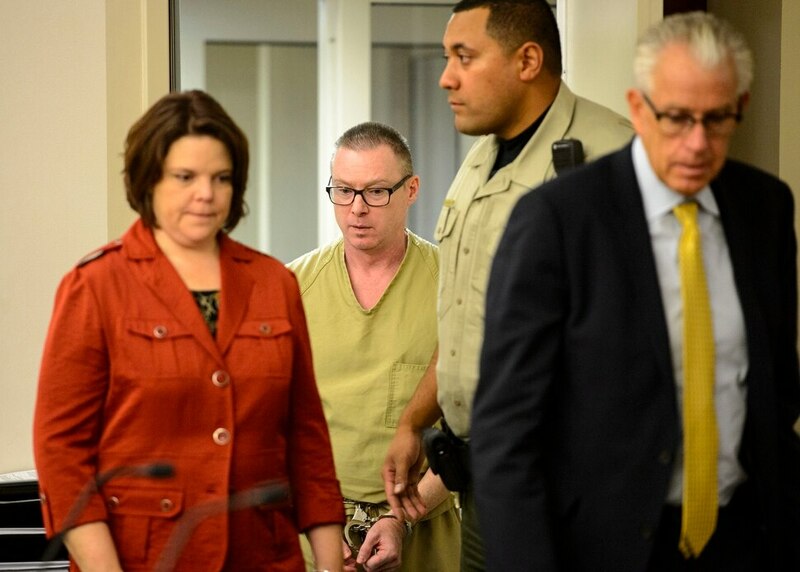 (Steve Griffin | The Salt Lake Tribune) Craig Crawford, center, enters Third District Judge James Blanch's courtroom for his sentencing after admitting that he trapped his 72-year-old estranged husband, well-known restaurateur John Williams, inside his home and then set it ablaze last year. Judge Blanch sentenced Crawford to life in prison without the possibility of parole at the Matheson Courthouse in Salt Lake City Thursday August 31, 2017. (Steve Griffin | The Salt Lake Tribune) Craig Crawford, listens as Third District Judge James Blanch sentences him to life in prison without the possibility of parole after Crawford admitted that he trapped his 72-year-old estranged husband, well-known restaurateur John Williams, inside his home and then set it ablaze last year. Sentencing was at the Matheson Courthouse in Salt Lake City Thursday August 31, 2017. (Steve Griffin | The Salt Lake Tribune) Craig Crawford, leaves Third District Judge James Blanch's courtroom after he was sentenced to life in prison without the possibility of parole after Crawford admitted that he trapped his 72-year-old estranged husband, well-known restaurateur John Williams, inside his home and then set it ablaze last year. Sentencing was at the Matheson Courthouse in Salt Lake City Thursday August 31, 2017. (Steve Griffin | The Salt Lake Tribune) Photos of John Williams outside Third District Judge James Blanch's courtroom after Blanch sentenced Craig Crawford to life in prison without the possibility of parole after Crawford admitted that he trapped his 72-year-old estranged husband, well-known restaurateur John Williams, inside his home and then set it ablaze last year. Sentencing was at the Matheson Courthouse in Salt Lake City Thursday August 31, 2017. (Steve Griffin | The Salt Lake Tribune) John Williams' niece, Amy Zaharis, speaks with the media after Third District Judge James Blanch sentenced Craig Crawford to life in prison without the possibility of parole after Crawford admitted that he trapped his 72-year-old estranged husband, well-known restaurateur John Williams, inside his home and then set it ablaze last year. Sentencing was at the Matheson Courthouse in Salt Lake City Thursday August 31, 2017. As he apologized for lighting a house fire last year that killed his estranged husband, Craig Crawford said he knew he had taken “something wonderful” from the world. The death of John Williams, a well-known restaurateur, devastated so many, Crawford said during a Thursday sentencing hearing. “That is because John was such a good man,” Crawford said, choking back tears. Before a judge ordered Crawford, 48, to spend the rest of his life in prison for killing his 72-year-old husband, Williams’ family members spoke about the hard-working man who helped shape the Salt Lake City dining scene and was a supporter of Utah’s LGBT community. Williams was generous, buying his sister a motorcycle for her 65th birthday or quietly paying tuition for a parking attendant at one of his restaurants. They remembered the way he smiled, how he laughed, the way everything about him just sparkled. “He had a contagious zest for life,” niece Laura Forsgren recalled. (Steve Griffin | The Salt Lake Tribune) Photos of John Williams outside Third District Judge James Blanch's courtroom after Blanch sentenced Craig Crawford to life in prison without the possibility of parole after Crawford admitted that he trapped his 72-year-old estranged husband, well-known restaurateur John Williams, inside his home and then set it ablaze last year. Sentencing was at the Matheson Courthouse in Salt Lake City Thursday August 31, 2017. And the person who benefited most from Williams’ generosity, brother David Williams told the judge, was Crawford. Williams’ family urged 3rd District Judge James Blanch to keep Crawford behind bars for the rest of his life, while Crawford’s asked the judge to give him hope and the chance to someday be paroled. After hearing three days of testimony this week, Blanch ultimately sentenced Crawford to spend the rest of his life in prison for the aggravated murder, saying it was a “cruel and vicious crime” that took some planning. The judge also sentenced Crawford to a five-year-to-life sentence for an aggravated arson charge, to run concurrent to the life-without-parole prison term for the arson murder. Crawford pleaded guilty to both charges last month. In exchange for his plea, prosecutors agreed to not seek the death penalty. The judge had the option to sentence Crawford to a 25-year-to-life prison term for the murder count, but said that after weighing all of the mitigating and aggravating factors presented by attorneys, he felt a life-without-parole sentence was most appropriate. “It‘s an extremely cruel way to kill a person,” the judge said. As the judge handed down the sentence, Crawford nodded his head, while Williams’ family cried quietly. Throughout this week, Crawford’s attorneys presented evidence of a ”constellation” of issues — a traumatic brain injury from a 2012 ski fall, methamphetamine use and psychosis — that they said helped explain why Crawford lit the fire. Defense attorney Mark Moffat told the judge that Crawford was psychotic at that time, but has begun to make changes after a year of being drug-free while incarcerated. Moffat asked the judge to not make a risk assessment Thursday, and leave that to future parole members in 25 or 30 years from now. But prosecutor Chou Chou Collins said the killing was planned, an act of revenge after Williams filed for divorce and cut Crawford out of his will. Earlier Thursday, Blanch heard testimony from Forsgren, who said that the last time she spoke to her uncle, she urged him not to go to his East Capitol Street home. Williams had served an eviction notice to his estranged husband the previous day, and had unsuccessfully sought a restraining order against Crawford. But on that May 21, 2016 night, a Saturday, Williams went to his own home after watching the symphony perform and having a late dinner with friends. In the early hours of Sunday, May 22, Crawford set the home on fire, trapping 72-year-old Williams, who died of smoke inhalation. At about 1:20 a.m., a neighbor called 911 to report that Williams’ house, near 600 North and East Capitol Street (200 East), was on fire. 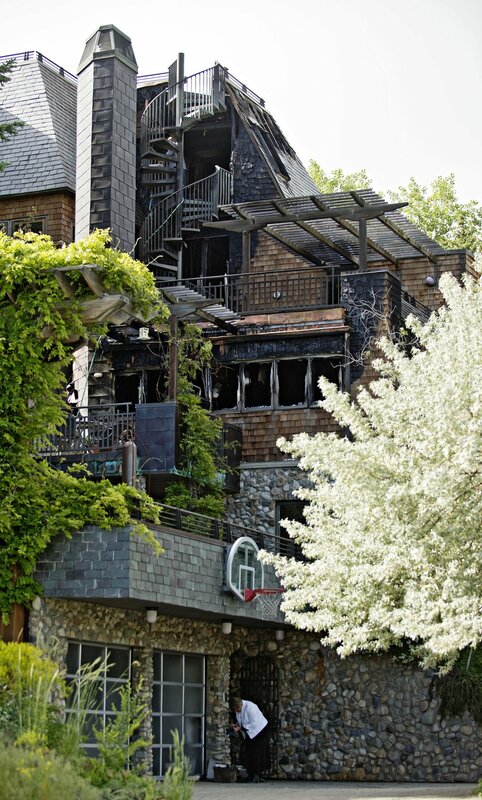 Lennie Mahler | The Salt Lake Tribune People survey damage after a suspicious overnight house fire near the Capitol building took the life of John Williams, 72, a partner in Gastronomy, Inc., which owns restaurants in Salt Lake City. Firefighters heard Williams cry for help, according to testimony, but they could not reach him because the staircase between the third and fourth floor had burned and collapsed. On the Friday before the fire, May 20, 2016, Williams had tried to file a temporary restraining order against his 48-year-old husband. In the legal paperwork, he wrote about a 2011 incident where Crawford punched and kicked him, and another time when his husband had threatened their dinner party guests with an axe at their Vancouver home. But attorney Matthew Anderson testified Thursday that the request was never filed with the court. Anderson described a hurried effort to draft the paperwork, which halted when his assistant called a court clerk — who told them there wasn’t an available judge at the courthouse because of a judicial conference they all were attending. They were told they could see a judge first thing Monday morning.